I’m attacked because of my tone. But the only problem with that is that everything I say below is the documented, God’s-honest-TRUTH. And there are too many people who have nothing but hostility, contempt and even hatred for the truth. What is America going to be like when the Antichrist, the beast of the Book of Revelation comes to power and implements a mark that everyone will be forced to take as an act of worship in “Dear Leader”? We already get to see hints of it today that reveal all the “who, what, when, why and where” details of that day that journalists ask. Why is Taylor Swift’s tweet about the Women’s March so controversial? While hundreds of thousands of people participated in Women’s Marches around the world on Saturday, many celebrities showed up as well, joining in with those protesting President Trump’s controversial campaign and election, particularly his treatment of women. The long list of stars included Miley Cyrus, Rihanna, Ariana Grande, Amy Poehler, Lena Dunham and many more; celebs including Madonna and Alicia Keys made speeches and performed in Washington. While many fans praised her for speaking out, the backlash started almost immediately; over the weekend, publications rounded up the critical comments. (Buzzfeed: “Taylor Swift Didn’t Go To The Women’s March And People Are Mad.” Cosmopolitan: “Taylor Swift Is Being Epically Dragged on Twitter By Her Fans.” PopCrush: “Taylor Swift Faces Backlash Following Too Little, Too Late Women’s March Support.”) But why is Swift’s tweet so controversial? There are two elements to the criticism. The first is that Swift, 27, was silent about the controversial, divisive presidential campaign until Election Day, when she posted a picture of herself in line to vote, urging her 83 million Twitter followers to do the same. It’s clear that many were interested in her views: “Who is Taylor Swift voting for?” was a popular Google search term last fall. I support what you women are doing, Taylor says. NOT rabidly ENOUGH, snarl the leftists. NOT with enough ANGER or enough HATE or enough VIOLENCE. It’s not ENOUGH with leftists to offer verbal support for one of their Nazi rallies; no, you’ve got to personally swear a blood oath of allegiance to the death to the Führer. THAT’S now what it means to be a “Democrat” today. You won’t be allowed to offer token lip service when the Antichrist comes to power. The Democratic Party will never allow that. Democrats will sniff you out and out you if you don’t support the Antichrist with adequate enthusiasm. The women who attended that hate rally in Washington D.C. – and just imagine if that many Republicans had organized to gather in our nation’s capitol to demonstrate their hatred and contempt for Barack Obama or Hillary Clinton, and how the Joseph Goebbels-style Ministry of Propaganda that is our leftwing mainstream media would have covered that gathering of conservatives – did NOT represent “women.” Not one woman I know was at that event; and furthermore not one woman I know, including numerous Hispanic women, fwiw, would have gone to that pro-infanticide witch conclave at the point of a loaded rifle with a bayonet attached. I could start blathering that I speak for all humanity, or I speak for all American men, or whatever, and if I did that I would be fit to be dragged away and fit with a jacket that featured sleeves that tie behind my back before being deposited in a rubber room. The ONLY person right now who has anything CLOSE to the mandate to speak for all Americans is the man who just got inaugurated president – which Democrats told us every single day of the Obama presidency. Inauguration Day marks the historically unparalleled event in world history in which there is a peaceful transfer of power following a democratically-held election of all adult citizens. But it is now a statement of fact that “Democrats” are fascists and Nazis who have already murdered TEN TIMES as many innocent human beings in their abortion mills as the Nazis murdered Jews in the Holocaust. “Democrats” have already murdered more innocent human beings than the total number that was killed – military and civilian alike, by act of war or by disease alike – of all human beings in our worst war in all of human history (WWII). And these are the worst sort of hypocrite fascists who tell us with straight faces that when THEY do something they would demonize their opponents for if they did the same thing, that they are actually acting in noble cause. WASHINGTON — As a self-described feminist and law student who wants to correct racial wrongs in the criminal justice system, Maria Lyon agrees with Hillary Clinton that “women’s rights are human rights.” But when thousands of women march on the capital the day after Donald J. Trump is inaugurated as president, she will not be there. The reason: She opposes abortion. Ms. Lyon is not the only feminist agonizing. Across the country, women who oppose abortion — including one in six women who supported Hillary Clinton, according to a recent survey by the Pew Research Center — are demanding to be officially included in Saturday’s Women’s March on Washington. But those requests have been spurned, creating a bitter rift among women’s organizations, and raising thorny questions about what it means to be a feminist in 2017. “If you want to come to the march you are coming with the understanding that you respect a woman’s right to choose,” Linda Sarsour, a Brooklyn-born Palestinian-American Muslim racial justice and civil-rights activist, and one of four co-chairwomen of the march, said in an interview on Tuesday. Oh, yeah. Sounds like all women were invited to celebrate womankind to me. As long as “womankind” is defined as far leftist radical rabidly intolerant fascists, anyway. 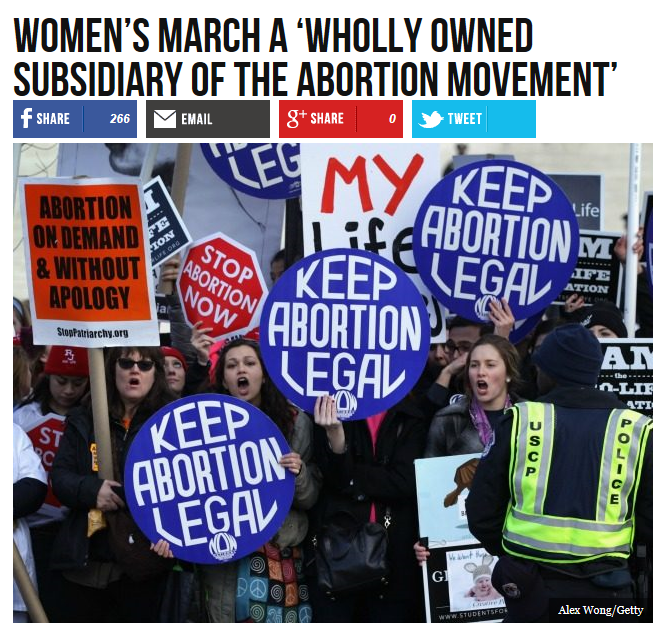 This march that hypocritically and dishonestly framed itself as “inclusive” BANNED women who believe that women in the womb deserve rights, too. While hundreds of thousands of marchers felt like they were getting their message out during the Washington D.C. Women’s March Saturday, not everyone enjoyed the experience. “It was a brutal day,” Kristina Hernandez, director of communications for the anti-abortion organization Students for Life, told USA TODAY after the march. Hernandez said that the group of around 50 people she was marching with were harassed because of the signs they were carrying which said “Abortion betrays women. “One of our girls was spit at, someone tore my sign in multiple pieces, we had people just yell at us but the main response was people just said ‘my body my choice’ when they walked past us,” said Reagan Barklage, the Western regional director for the group. 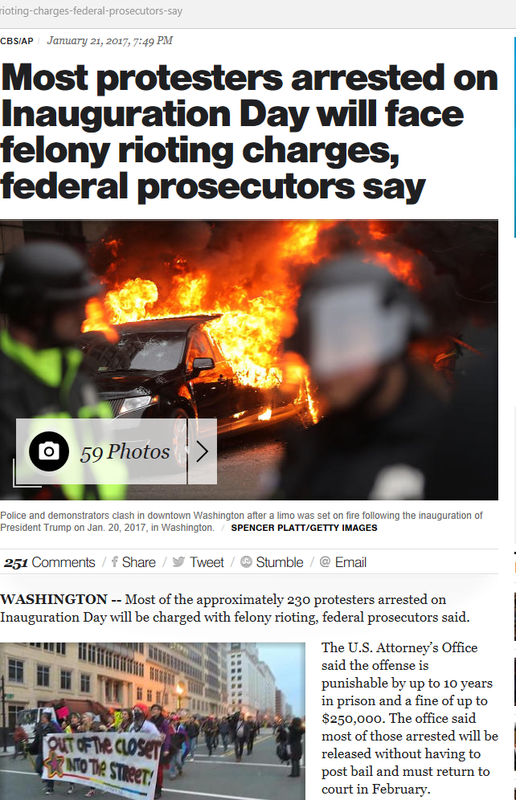 Again, just imagine if conservatives had rallied huge numbers of violent people to swear they would burn the White House to the ground before they would allow Barack Obama or Hillary Clinton to be their president and had physically assaulted and spat at groups supporting leftist causes would have been depicted in the mainstream media. I have a feeling such a march would not have been framed so nicely. Again, IF you are a Democrat, you are a hypocrite without decency, without virtue, without honesty and without honor of any kind. If you are a Democrat, you are the moral equivalent of a roach. Loyalty to the Third Reich, and Adolph Hitler in particular, was essential to the Nazi Party. Reichsführer Rudolph Hess said, “The National Socialism of all of us is anchored in uncritical loyalty, in the surrender to Der Führer that does not ask for the why…but in the silent execution of his orders. We believe that Der Führer is obeying a higher call…There can be no criticism of this belief.” Hitler exacted from the officers and soldiers of the armed forces an oath of allegiance to himself, rather than to Germany, which included the words, “I will render unconditional obedience to Adolph Hitler…and to risk my life at any time for this oath.” As a symbol of that loyalty, they – and everyone in Germany – were obliged to give the “Heil Hitler” salute. Sorry, Taylor Swift. Your crime was that you didn’t raise your hand quite high enough and scream your “Heil Hitler!” loud enough. Democrats have no respect for people who support Donald Trump, no respect for people who did not support Hillary Clinton, no respect for people who didn’t or will not publicly hate Donald Trump or support the right to murder babies loudly or demonically enough for their taste. I personally started out opposing Donald Trump. And you can see what I said and why I said it here. I was literally questioning if I could in my own conscience vote this man or in any way, shape or form support his candidacy. But Hillary Clinton and her roach-army of Democratic Party supporters proved to be so beneath VILE that I realized that in this election, this binary choice between one of two candidates who would be our next president, that I had to support awful in order to avert EVIL. It was as simple of a choice as this: given the “choice” between having my right arm chopped off or all four of my limbs chopped off, and rightly believing that one of those two “choices” was going to happen whether I liked it or not, I would choose to have my right arm chopped off. Don’t blame anyone but YOURSELVES and YOUR OWN DEMOCRATIC PARTY for the rise of Donald Trump, Democrats. YOU did this. YOU poisoned the well. “Some of the rules.” Well, as the angriest black leftists say, “That’s mighty white of you” – to selectively and arbitrarily follow ONLY the laws that you like while ignoring all the ones you don’t. So why did I vote for Trump? Mobs of brutal Democrats – and let’s just call them what they are: vicious Brownshirt fascist thugs – descended upon people who believed that the 1st Amendment of our Constitution provides the right of free speech and the right to peaceably assemble to hear that free speech. 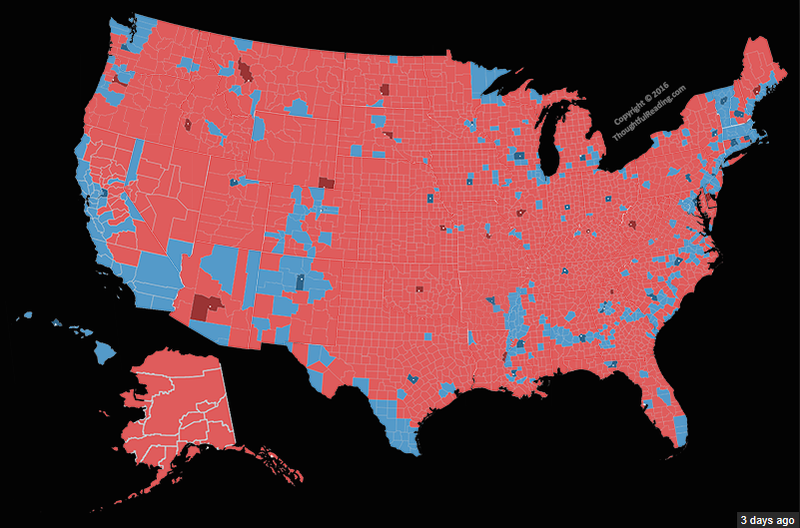 But Democrats are no longer people who are capable of TOLERATING free speech or the results of a democratic system. They will violently riot. They will scream you down. They will spit on you and physically beat you. We’re already seeing that in spades. And it’s beyond obvious that they are going to get worse and worse. Because the Democratic Party is the Proto-Party for the Coming Antichrist. Democrats are becoming more hysterical, more angry, more rabid, more hateful and more violent by the day, if not by the hour as the political party of sociopathy becomes increasingly psychotic.